I’m still groggy from my predawn start as I wade through the crowds of spectators, the competing music from different loudspeakers vibrating me to my core. At 6:30 a.m., this party’s been going on all night, but seems only to be finding its rhythm now, moments before dawn. Dangriga, the district capital of Stann Creek in Southern Belize, has seen its population double overnight to over 20,000 strong . As I’m shaking off the tendrils of sleep, I see little children hurrying up to the riverside in their costumes, some too big but all very colorful. 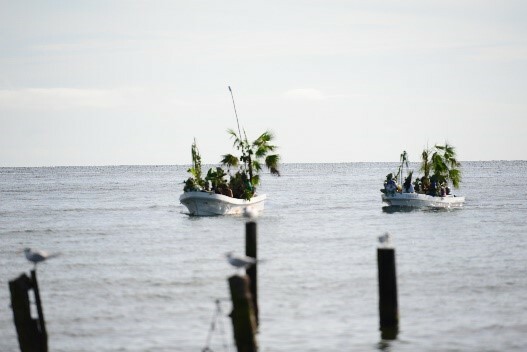 Dawn is just breaking, and the most important celebration in Southern Belize (and in all of Belize, if you are Garifuna) is about to get under way. Then the drumbeat starts, slowly at first, quietly… I can’t quite make out where it comes from. The beat is picked up by more drums, and, as the crowd shifts, I see the troupe of drummers on a makeshift stage. Brightly dressed in traditional garb, they start to sing in a language nearly forgotten to this world, a rich, vibrant chorus of undulating song that both speaks of its deep African roots and of its Central American ties. It is dawn on Nov. 19: Garifuna Settlement Day. 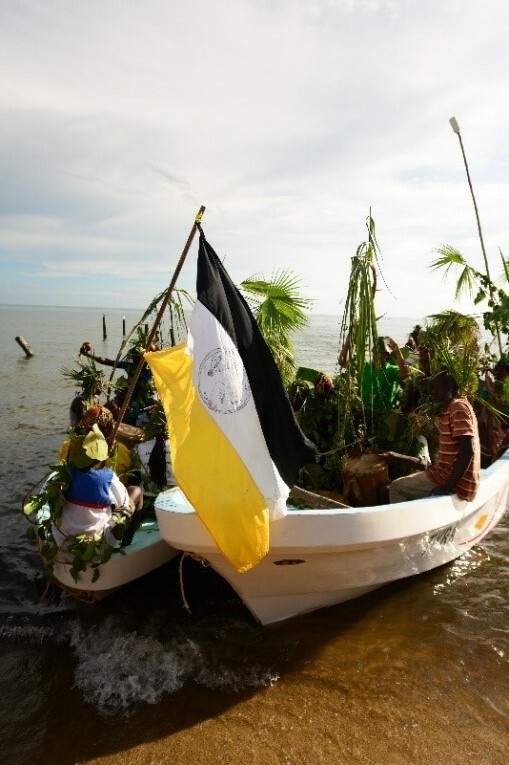 The occupants of the boat carry with them the yellow, white, and black flag of the landless Garuganu (Garifuna) Nation and symbols of the food and culture the original refugees relied on: cassava, sugarcane, coconut, plantain, and banana, without which the Garifuna culture neither would have survived nor would her people have remained free. 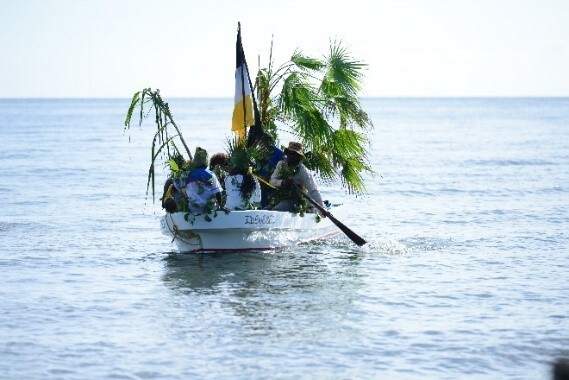 This celebration is not merely last night’s party or this morning’s reenactment, this is a weeklong celebration of life and the Garifuna culture and people. Big bashes (street parties) have been going on all week, and we’ll have the Miss Garifuna Pageant tonight along with the infamous “Battle of the Drums” competition. It’s a family time, a celebration time, a time of fun and silliness. Smiles abound, and you won’t find anyone who doesn’t seem to be high on life (and more than a little Belikin beer). It’s not just traditional songs and the outrageous and raucous punta music that’s heard today. We also hear the songs coming from the Garifuna (Catholic) mass alongside the drumming and singing on the street. Aside from street tunes and church chorales, Garifuna music can also be found in stores. The late, great Andy Palacio is probably the best example of a professional Garifuna artist. A traditional singer and musician as well as a Garifuna activist, Palacio won the World Music Expo (WOMEX) award in 2007 and was named a UNESCO Artist for Peace for his works. Listen to some of his music here. Centuries before the arrival of the conquistadors, the existing South American and Caribbean native populations mingled with the Arawak indigenous cultures of Saint Vincent and Martinique. In 1635, two Spanish slave ships wrecked off the coast of Saint Vincent, and the survivors intermarried with the islanders, adding West and Central African languages and cultures to the mix of South and Central American heritages… and the Garifuna culture was born. By 1775, the Garifuna on Saint Vincent far outnumbered the dominant colonial representatives, and, given that these were free islanders who didn’t want to work for the pay and conditions expected of them by the slave owners who also inhabited the island, tensions rose. In 1796, facing inevitable enslavement by the disgruntled English plantation owners, the Garifuna staged an uprising hoping to remain free. This uprising was brutally put down, and the remaining survivors were deported indirectly to the island of Roatán, Honduras… their conquerors realizing the Garifuna would to be too strong to break and not worth the trouble. Conditions were harsh for the 2,500 or so survivors of the forced migration, and, by 1802, a small group of settlers had migrated from Roatán to mainland Belize, where the natural abundance and seclusion of the country offered peace, security, and comparative prosperity. The first major migration of the Garifuna people occurred in 1832, led by the charismatic leader Alejio Beni. The progeny of this migration populated the areas that became the towns of Dangriga and Punta Gorda and the villages of Seine Bight and Hopkins. Today, the Garifuna number approximately 600,000, spread primarily around the Caribbean regions of Honduras, Belize, Guatemala, and Nicaragua, and a large population has also migrated to the United States. The first celebrated Garifuna Settlement Day was held Nov. 19, 1941, and continues today to honor the mixed culture and proud history. Garifuna culture is matriarchal, with women traditionally responsible for most of the work. Cooking, cleaning, child-rearing, and growing crops were traditionally all women’s roles in past times. The menfolk were fishermen. Language: Garifuna language is a mix of South American, Arawak, and Central and West African languages. 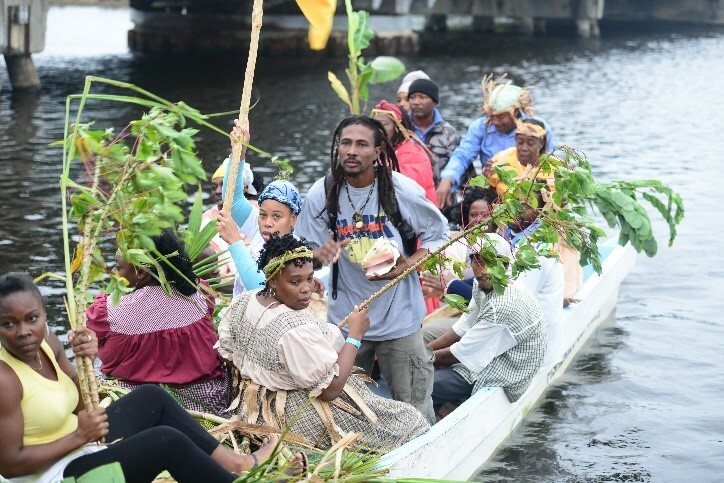 Dugu: A spiritual ritual connecting the Garifuna people with their ancestors. Garifuna tradition sees those who have gone before as still present and part of the daily lives and celebrations of the community and family. Punta: A fast-paced dance with rhythmic beat and suggestive moves that is enthusiastically performed at all celebrations and family gatherings. Watching granny “wind it up” can be both a hilarious and extremely uncomfortable spectacle for the uninitiated viewer. Dory: A dugout canoe traditionally and painstakingly carved out of a single tree trunk by setting a fire on top of the trunk and, when it goes out, chipping and scraping away the charred remains. This process is repeated over and over until a valuable fishing canoe is created. Jankunu dance: A dance that both celebrates Garifuna freedom and mocks their former colonial aggressors. White-clad dancers with pink facemasks are said to represent former colonial masters. The Garifuna dancers appear subservient when under the master’s watchful eye, but the colonial figure is ridiculed and outrageously mocked by the dance characters as soon as his back is turned—much to the amusement and satisfaction of the crowd. This good-natured and lively dance is accompanied by up-tempo traditional music. Primero and Segunda drums (tenor and base): Made from mahogany and stretched deer skin, these drums echo out the African beats still so recognizable today. Foods: Cassava, coconut milk, garlic, basil, black pepper, banana, and plantain all feature heavily in Garifuna cooking. Boiled fish in coconut milk served with mashed plantain, called hudut, is rich and delicious—a delicacy not to be missed. However, cassava is a naturally occurring source of cyanide. To prevent illness and even death, the Garifuna learned how to process cassava by grating, mashing, soaking, and drying it to make an edible flour, which can be made into ereba, cassava bread. Nowadays, low-cyanide species of cassava have been isolated and the risks are much diminished. Come to Belize to celebrate the unique culture of the Garifuna and discover their far-reaching global history.